Gaza terror group claims that it has the power in the truce talks, not Netanyahu; calls for full lifting of blockade. Even as Israel eased the ban on Gaza fishermen Sunday in a "goodwill" gesture during the Cairo truce talks, Hamas declared that only it will decide "when Israelis return to their homes" in the rocket-beleaguered south. Hamas spokesperson Sami Abu-Zuhri said "the Israelis won't be secure until our people are secure, until they remove the blockade from us completely." Ironically given his "concern" for Gaza residents' security, Abu-Zuhri early in the operation exhorted Gazans to serve as human shields in a TV interview. 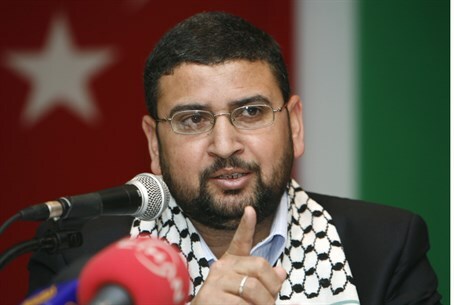 Abu-Zuhri spoke on Sunday while at a Hamas support rally in Rafah, according to the Palestinian Arab Ma'an News Agency. "The Israelis won't return to their homes until Hamas lets them, and not (Prime Minister Binyamin) Netanyahu," threatened Abu-Zuhri. "The preference is to reach an agreement, but the occupier needs to stop delaying; we are looking for an agreement not from weakness but rather from a position of power." The threat comes as many residents of the south near Gaza have been displaced from their homes for over a month, under the ongoing barrage of rocket and terror tunnel attacks that are on a temporary pause during the ceasefire set to end Monday night. Ten thousand people joined residents of the Gaza Belt area protesting in Tel Aviv's Rabin Square last Thursday, where they called on Israel to finish the job in Gaza, ending the threat through decisive action. However, as noted above Israel on Sunday made one-sided concessions before any agreement was reached. Abu-Zuhri's threats come after Hamas said it is conducting talks with Israel "at gunpoint." Abu-Zuhri's comment about not looking for an agreement out of a position of weakness may come in response to Netanyahu's remarks Sunday, in which he said "if Hamas thinks it will make up for its military losses with a political achievement, it is wrong."